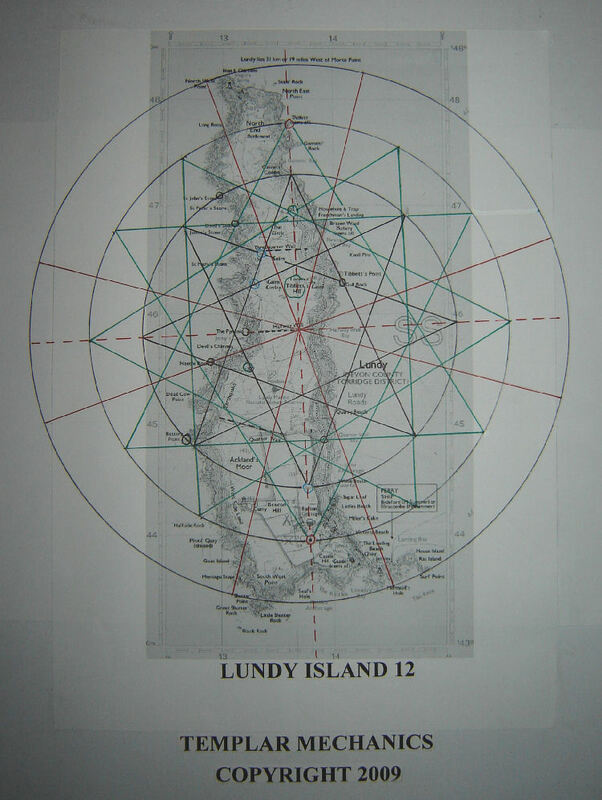 All the consciousness grid systems to date have been confirmed as they developed through serendipitous events and being aware of the signposts that come into view as you journey through the geometry. 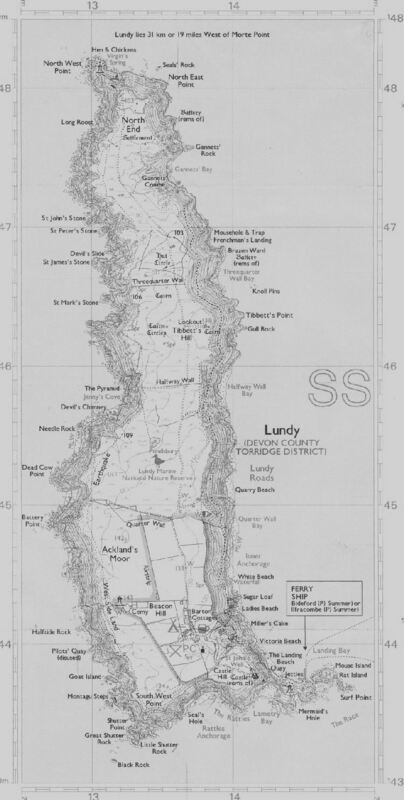 ….Lundy was no exception. 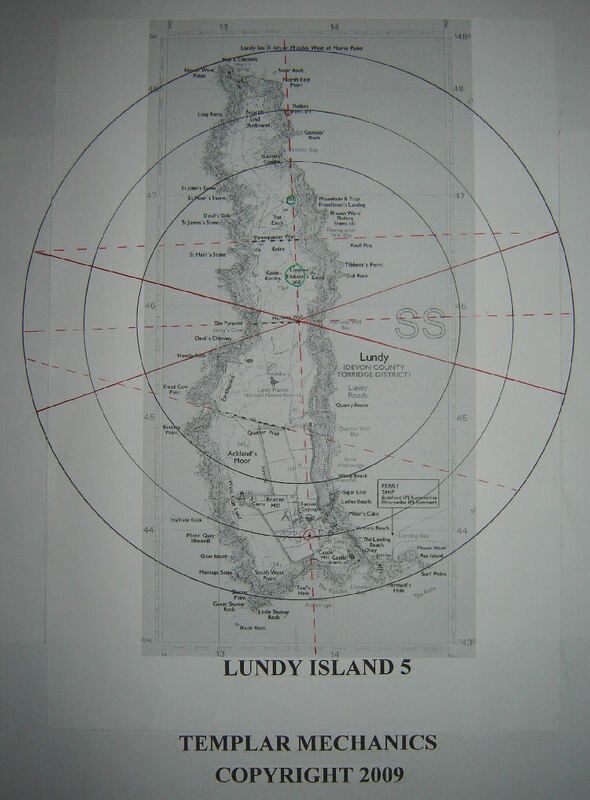 One glance at the map below shows a fascinating selection of mysterious places and features on Lundy Island…….it pulls you in with its mystery. Names such as The Pyramid, Knights Templar rock, St John’s stone, Devils slide, Mouse and trap, Devil’s chimney, Black rock, Mermaid’s hole, Rat island, Mouse Island, Miller’s cake and Sugar loaf……all told it looks the perfect setting for the next Stephen King book. None of the above stand out more than the 3 key features that unlock the geometry….. these are quarter wall, half way wall and three quarter wall. Nothing manifests by accident and there is no such thing as coincidence,……only the illusion of it. If the perfect mathematical symphony of the snowflake can fall from the sky you can be sure the same magic resides down here all around us…..for those with eyes to see. Looking at the layout of the Island the 3 wall boundaries marked as three quarter wall, half way wall and quarter wall looked odd to say the least. Half way wall and three quarter wall look to be built parallel to each other . 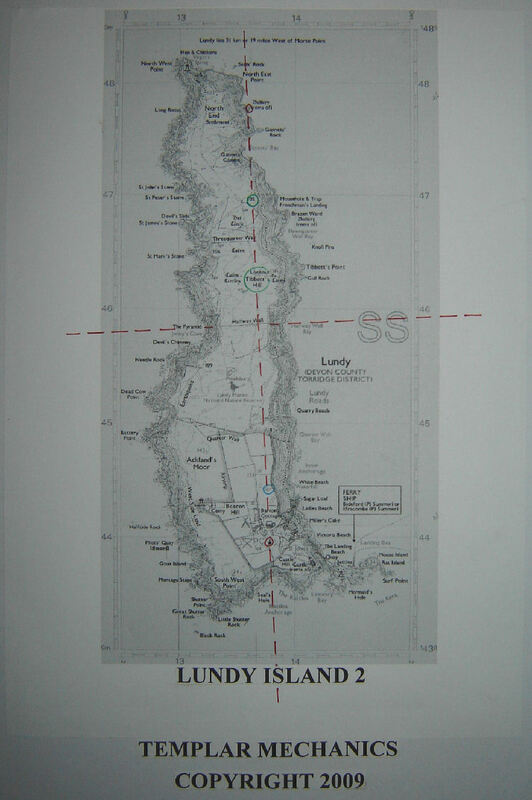 Quarter wall’s exact alignment was harder to judge ….but the boundary path running across the island at the quarter wall point looked to be a boundary marker from the same inspirational producer of halfway wall and three quarter wall. If halfway wall to three quarter wall marks a quarter distance measure then it should be easy to determine the total measurement that the wall positions are pointing to. With half way wall and three quarter wall running parallel this is a reliable measure to work the other distances out from. 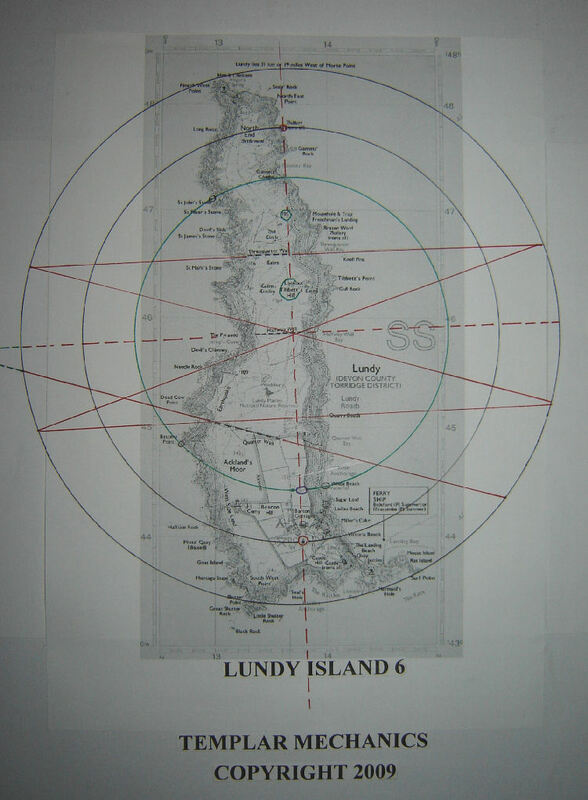 But first we have to find the main axis…The E/W axis turned out to be the alignment marked by halfway wall going across the Island ……along this axis there should be a N/S axis alignment at 90 degrees to the E/W axis…... This was easy to spot, due to the narrow dimensions of the Island and the limited features. The Church of St Helens fell in perfectly . The N/S axis line brushed the point marked on the map as ‘North East’ point, then went through a prominent coastal point showing ‘Battery remains’, through a high point marked as a 301 spot height, through Tibbets hill then passed through halfway wall where the footpaths meet to create a cross on the landscape . An axis/cross point marked in the physical, is a common feature included in the other systems discovered, the crossroads at the vesica intersection of the Temple Bruer system being a fine example. Now we have our two main axis lines we can work out the measure being noted by the positioning of halfway wall and three quarter wall. If the distance between three quarter wall and halfway wall is supposed to mark a quarter distance of the length of the island it is very inaccurate ……maybe the measure refers to something else. Using the distance from three quarter wall to halfway wall and doubling it would then give us the half distance measure being pointed to by the positioning of the walls…..and the first possible circle radius measure. Putting the compass point on the axis point marked by the meeting of pathways on halfway wall and drawing in the first circle noted some interesting features on the circles circumference…St John’s stone, waterfall, a natural spring and Gannets Combe. I now extended the line of three quarter wall and also the boundary/wall/path alignment marked next to Quarter wall. It’s worth noting at this point the position of the feature labeled ‘Pyramid’ and its position on the main E/W axis line. Knowing there would be other circles I penciled in two more…. an intuitive extreme land point circle, and another marking the distance of St Helens church to the South….which sits also on the main axis. The church circle passed through the jutting coastal land feature to the North which was marked on the map as having ‘Battery remains’. Its position exactly mirrored the church’s position on the same N/S axis……..another common feature with other systems. The cave at Royston is mirrored on the main axis by Denny Abbey, both sites at one time being influenced by the Templar’s. 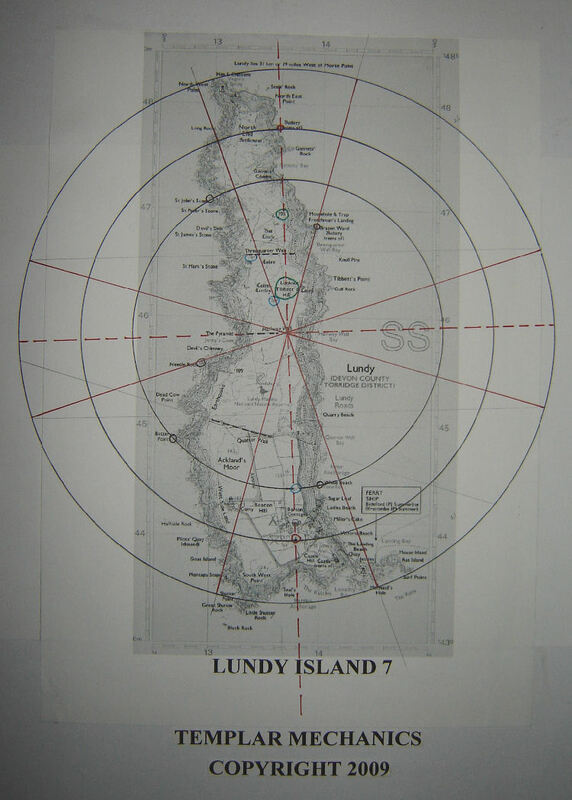 To mark the possible ‘extreme land point circle ‘I centered the compass on the main axis crossing and extended the compass to pass through ‘Hen and Chickens’ in the North and also pass through the feature marked on the map as ‘North West’ point and followed the circle round to see it pass through ‘Surf point’ in the S/E and ‘Shutter point’ at the S/W of the Island. I also extended the quarter wall alignment feeling this to be relative to the building geometry…..If halfway wall and three quarter wall were parallel and distance markers then the angle of the boundary/path at quarter wall would also fall in. Seeing the parallel arrangement of halfway wall and three quarter wall I drew in a parallel line with the quarter wall line through the centre axis point …..as I did this it merged with the three quarter wall axis line and as such confirmed the outer circle diameter, drawn previously…which circles the island .The next thing was to rebalance the system and draw in the other line through the central axis…this then passed through Needle rock. These crossing lines can now be seen to mirror the widening bays E and W of the central axis crossing point. With these two new lines passing through the central crossing point I checked for alignments 90 degrees of the two new base lines. 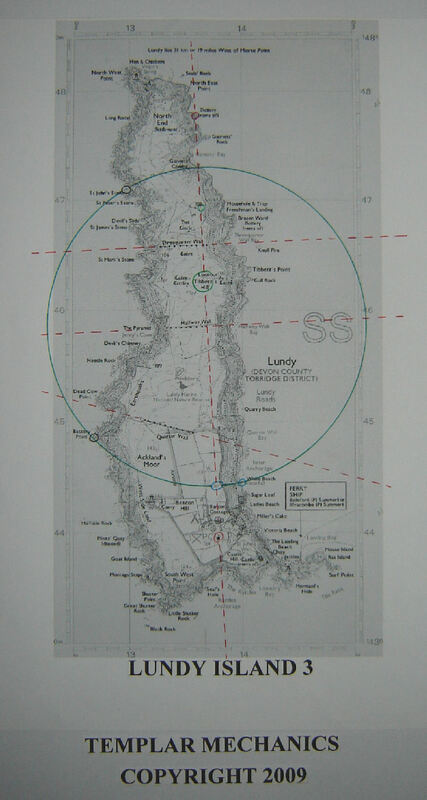 One line connected the extreme land feature marked as ‘North West point’ , through another feature called ‘Long Roost’, then on through to a Cairn, narrowly missing a feature marked as ‘circles’, possibly stone?, through a spring , then the central axis crossing point and onto Mermaids hole in the far SE. The other line passed through ‘Brazzen Ward’ coastal land feature which also has ‘Battery remains’, through the central axis crossing, cemetery at Beacon hill and on to the feature known as ‘Montagu steps’. My attention was now drawn back to the Pyramid feature on the main EW axis so I decided to draw in a 51.51 GP holistic ratio triangle off that base line to see where the top point would meet, or whether it would interact with any of the existing geometry. 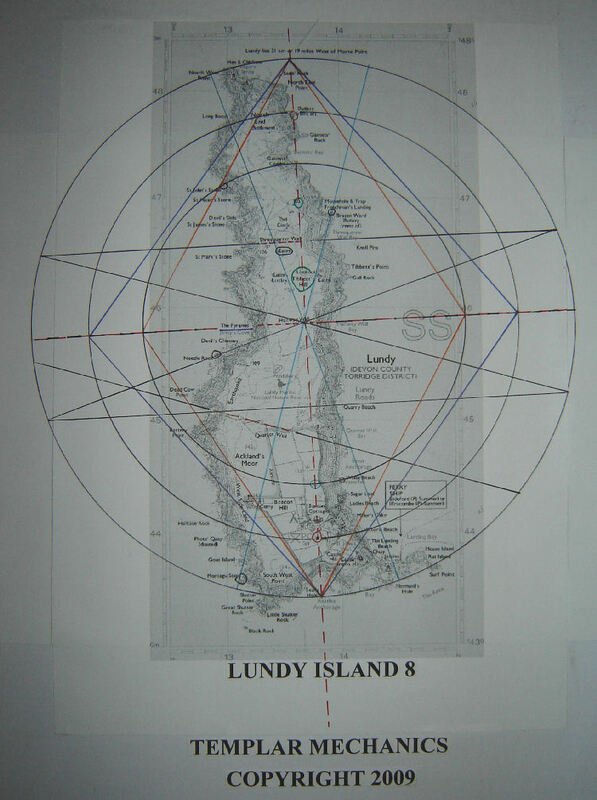 Using the ‘church circle’ diameter as the Gp base I measured the GP angles off the main EW axis to see the points merge at the top hitting exactly the outer circle circumference that circles the main body of the Island. 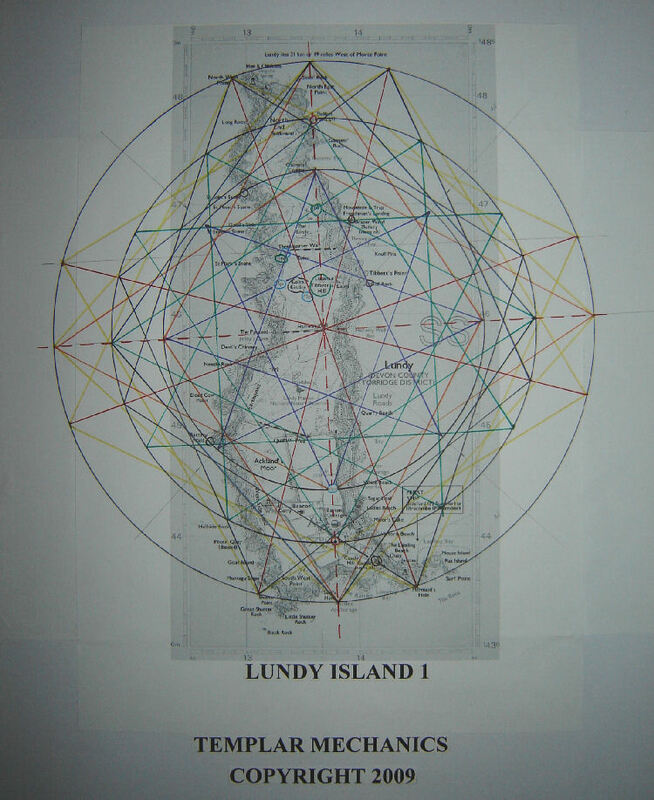 This means holistic Earth / Moon proportions were present in the geometry. 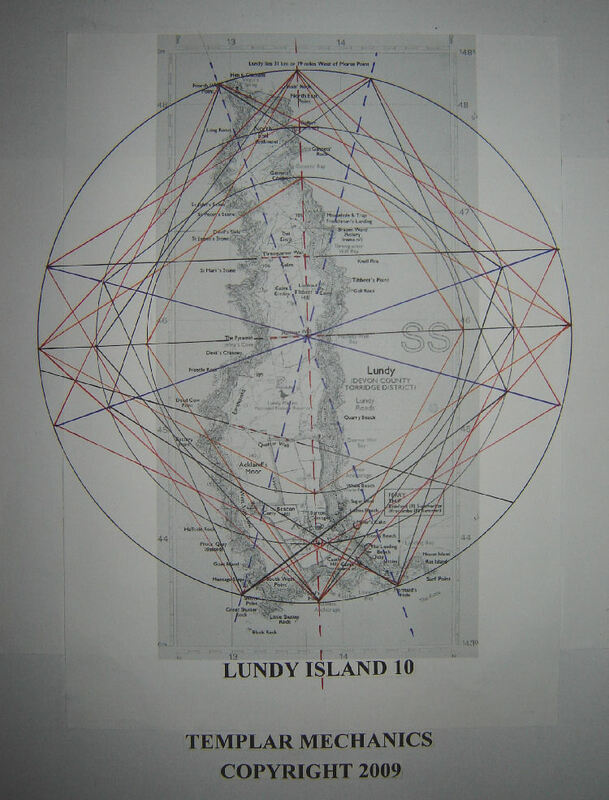 I then drew in another triangle from the smaller inner circle to the very same top point on the outer circle this created a perfect 60 degree (equilateral) triangle … The top 60 degree North triangle also passes through St John’s Stone again which was situated on the very inner circle,…. 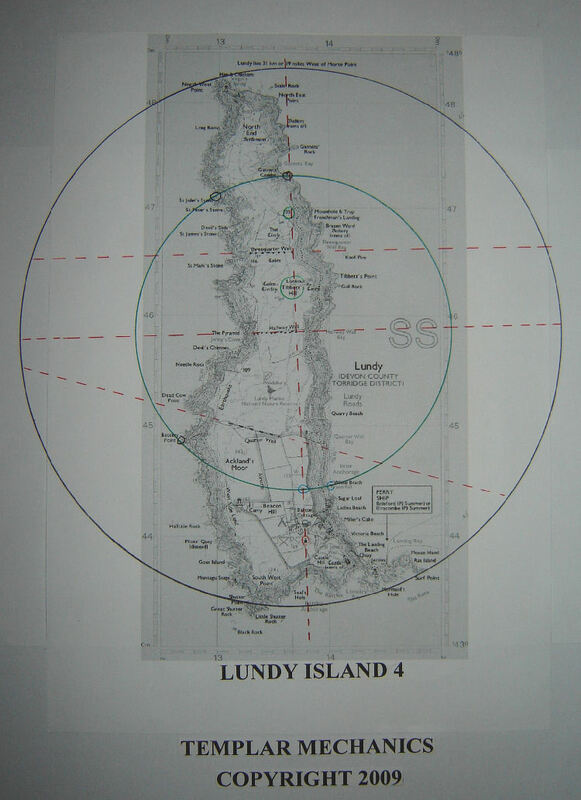 the diameter of which is gained from decoding the distances pointed to in the layout / design of the 3 walls on the island. The equilateral triangle lines also pass through’ Miller’s Cake’ and ‘Dead cow point’…….another two corners of the 60 degree triangles are marked by the Spring found on the main axis and Gannets Combe . Confirmation of the outer circle diameter had now been shown in several ways. 1. The decoding of the 3 walls and the convergence of alignments at the outer circles circumference. 2. 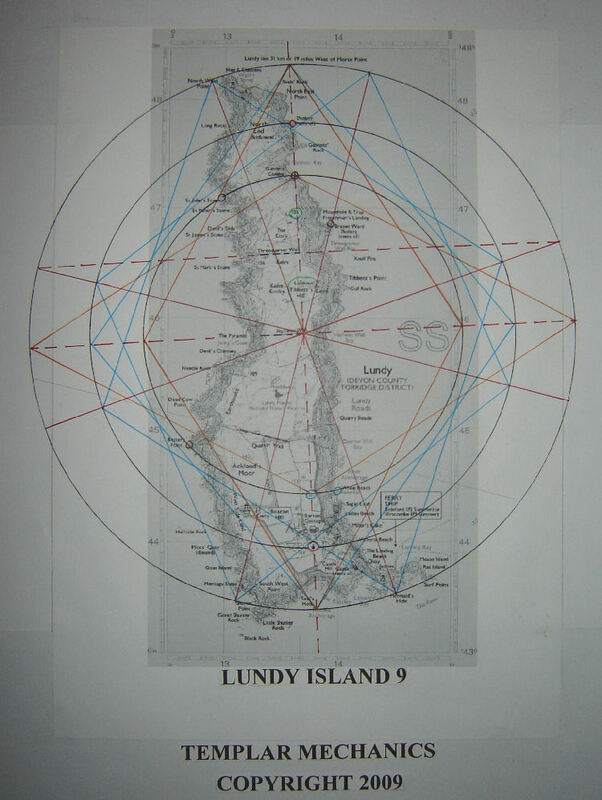 The Outer circle defines the main body of the island. 3. The converging 51.51degree holistic Gp triangle top points converge on the outer circles circumference. This pyramid triangle is constructed from the central E/W axis base line on which there is a feature called ‘The Pyramid’. This base line is marked by the Half way wall which is now confirmed as the main EW axis. 4. The ‘church circle’ diameter becomes the base measure for constructing the 51.51 pyramid triangle off the central EW axis. The other 51.51 pyramids can now be drawn in, the lines passing through Beacon Hill and ‘Castle remains’, the pyramid lines also brush the church on the North side. Squaring the 3 pyramid axis sees the church now closed in on the south side also…so sits within its own mini rhombus on the central axis and also on the circumference of the circle that defines the base length of the Pyramid triangle. Octagon has now formed in the central area created by the crossing lines of the 60 degree equilateral triangles marked in orange. 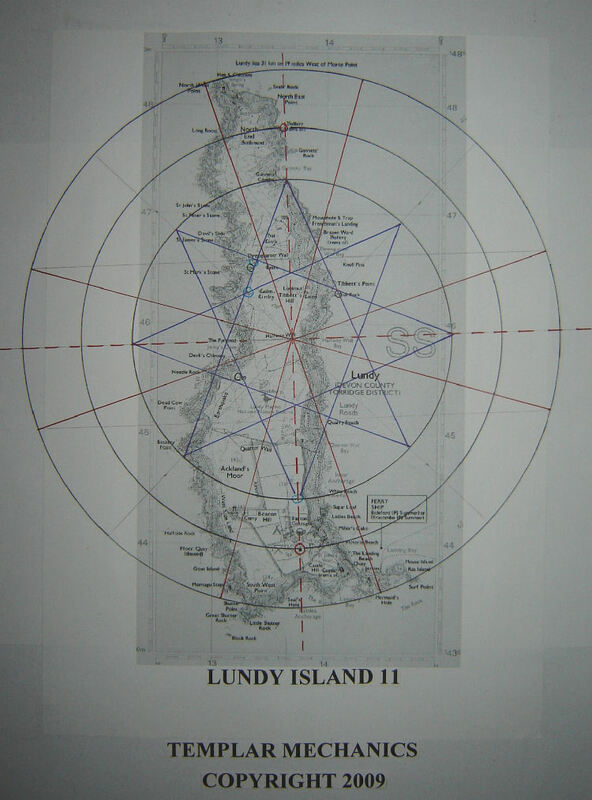 An 8 pointed star now runs with the curve of the Islands central land mass and marks relative land features at ‘Battery point’, ‘Gannets bay’, Two springs and a natural high point marked as 106. ‘Gull rock’ is at the crossing of two ‘star’ lines this is just above the feature known as Knights Templar Rock. 4 points of the 8 pointed star meet at the intersection of Star of David…..creating an inner square. Star of David points into St Helens church and the mirrored coastal point to the North on same main axis noted on map as ‘Battery remains’. If you focus into the graphic for any length of time different shapes will appear and fade as your focus changes.